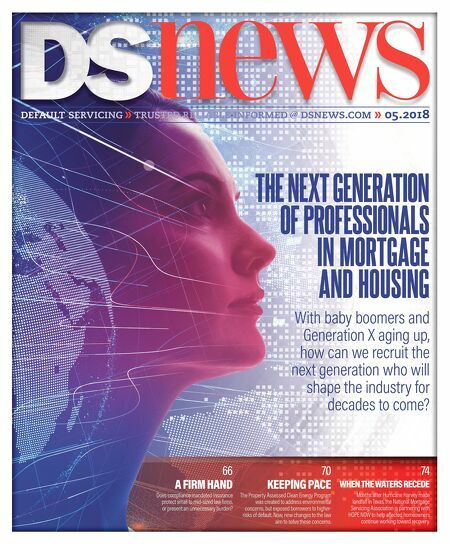 default servicing trusted reliable informed @ dsnews.com 05.2018 With baby boomers and Generation X aging up, how can we recruit the next generation who will shape the industry for decades to come? THE NEXT GENERATION OF PROFESSIONALS IN MORTGAGE AND HOUSING 66 A FIRM HAND Does compliance mandated insurance protect small to mid-sized law firms, or present an unnecessary burden? 70 KEEPING PACE The Property Assessed Clean Energy Program was created to address environmental concerns, but exposed borrowers to higher- risks of default. Now, new changes to the law aim to solve these concerns. 74 WHEN THE WATERS RECEDE Months after Hurricane Harvey made landfall in Texas, the National Mortgage Servicing Association is partnering with HOPE NOW to help affected homeowners continue working toward recovery.